Find below the detailed options to create a VLAN. Parent Interface. Set a NIC or Bonding interface as parent where the VLAN will be configured. Name. 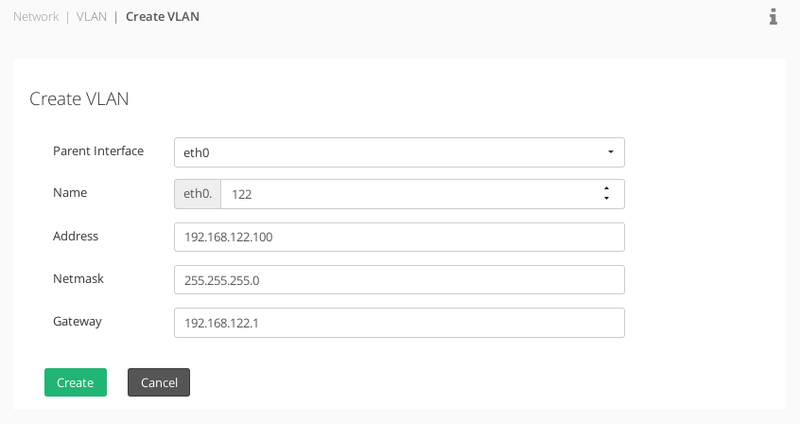 Set a name to identify the new VLAN, the name starts with the name of the Parent Interface followed by the VLAN tag to be used, and they are separated with a dot. Address. Set an IPv4 address for the new VLAN. Support IPv4 and IPv6. Netmask. Set a network mask for the new VLAN. Gateway. Set a default gateway for this VLAN interface. This field is optional. Once all the required changes are done, press the Create button to create the new VLAN interface.